Composite resin also known as (white fillings) is a special material your dentist uses to replace loss tooth structure. Composite material is made of ceramic and plastic compounds. This material restores tooth structure that’s loss from tooth decay or it can also be used for cosmetic improvements. Composite fillings are being used more than any other type of fillings, this is because patients want something that looks natural in their mouth. At Smiles on Bristol Dentistry Dr. Danial Kalantari prefers to use composite fillings for his patients. How are composite fillings placed? Composite fillings not always require anesthetic; this is because they are chemically bonded to the tooth. The anesthetic will be administered if the decay has grown beneath the enamel layer. After the anesthetic (if necessary) your dentist will begin to remove the affected part, your dentist will then place an acid etch on the tooth to prep the tooth for bonding, after the bonding the composite material is placed and then set with a special light. Last the dentist will adjust the filling according to the occlusion of the teeth. What are the advantages of composite fillings? The main advantage of having tooth colored fillings are the aesthetics. White fillings also require less tooth structure to be removed, providing further support. Composite can be used not just to fix dental caries it can also repair chipped, broken or worn teeth. This type of fillings also hardens in seconds unlike amalgam fillings that need hours to completely set. What are the disadvantages? Some disadvantages are that after composite fillings you may experience sensitivity. 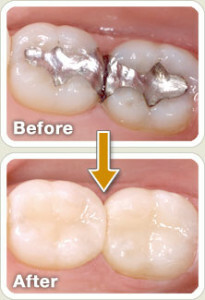 Tooth colored fillings wear out sooner than amalgam fillings on average they last about 5 years and the amalgam 10-15. Composite will increase the time in the chair because of the steps that are needed. This entry was posted in dentist, santa ana, smiles on bristol and tagged Composite Resin on August 24, 2016 by Francisco Torres.